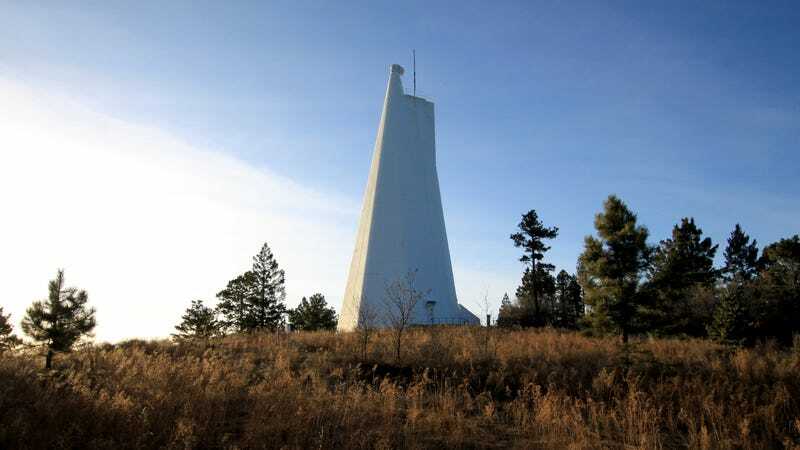 It has been a week since the National Solar Observatory in Sunspot, New Mexico, was shut down, evacuated, and visited by FBI agents—and the undisclosed “security issue” behind all this activity remains a mystery to the public. Theories about the true reasoning behind the shutdown range from an accidental interception of military signals to captured proof of alien life. FBI’s Albuquerque Division did not respond to a Gizmodo request for comment. AURA’s silence on the matter is only encouraging more wild speculation and citizen sleuthing. YouTuber Dj.R@NSOM of 4:20 TV FREEDOMIST FILMS filmed his walkthrough of the area on Thursday and observed the premises is still completely abandoned. He found nothing that sheds light on the security issue, but he did find a discarded X-Files DVD resting on top of a trash bin. The Association of Universities for Research in Astronomy (AURA) has decided that the observatory will remain closed until further notice due to an ongoing security concern. The rest of the National Solar Observatory (NSO) facilities remain open and are operating normally.